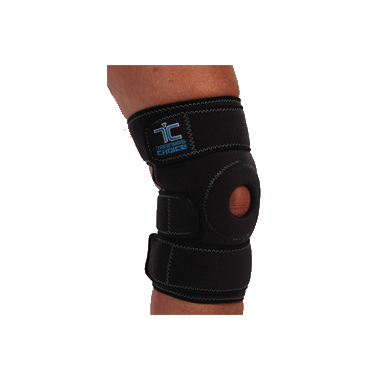 Trainer's Choice Knee Compression Wrap helps reduce swelling, promotes warmth and helps minimize discomfort from sprains and strains. Comfortable and easy to wear. Adjustable compression. Fits right or left. INDICATIONS: Minor strains and sprains, Mild PFS (Patellofemoral syndrome), Tendonitis, Arthritis. I used this brace while skiing at Whistler and it was basically a one use brace and fell apart after the trip. Materials are very cheap and the compression factor of the material low. I would not recommend this product to an active person.